Super Scary Sale + 4 Chances to Win! Yes I know I'm a bad blogger. Spring is always crazy for me. And this year I have to finish Scent of Magic. Yes, I know the book won't be released until the very end of 2012, early 2013, but my editor likes to have it a year in advance if possible. I'm trying to finish it by April 15th. Spring is also school sports season for my kids. Luke plays volleyball for his high school, and Jenna plays soccer for her middle school. So everyday after school they have practice and games and fundraisers and really really smelly socks. And tis the season for field trips, concerts, and conferences. In case you missed my latest newsletter, I wanted to let everyone know about a super sale for SPIRITED: 13 Haunting Tales. The e-book is currently on-sale for 0.99 until April 8th!! The print edition is also out now! And to celebrate the release of the print book - I'm giving away FOUR copies of SPIRITED. To enter to win - post a link to my website or blog or books (or all three) online (on Facebook, Goodreads, Twitter, etc...) and then let me know in a comment to this blog what you did (also include your email addy, please). Three posts gets you three chances to win! You must post the comment by Friday, April 6th midnight EDST. 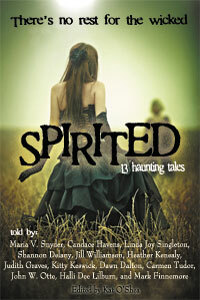 SPIRITED is a wonderful collection of haunted houses, haunted hearts, and a past that refuses to die. And the best part - ALL PROCEEDS from the anthology (both print and e-Book) will be donated to National 826, a literacy-based charity! Yep - all the money is going to support literacy. Here's a blurb from the back: Get entombed in stories of Egyptian treasures, shudder at tales of malevolent spirits, and become enthralled with the adventures of witch-hunters, ghost seekers, and lost souls. From steampunk to cyberpunk, our collection spans past, present, and future hauntings. One story actually leaps off the page with 3-D augmented reality. My story is titled, NEW GIRL (titled before that TV show - and not the 3-D one :), and you can read an excerpt on my website at the link below. ooooh I'm the 700th follower on your blog! ;^) heehee! anywho- My tweet about your blog giveaway! I posted this on my FB wall (tagged you in it) and tweeted about it too. Hey Maria! I posted this on FB! Hers the link! Fantastic!! I'm really excited to read this :) I love a lot of the authors. please finish ur book fast... even then I will have to wait till it is published in india :( I never miss a chance to read ur book.. thanks to my wife Jeena.. if she had not given me 'Poison Study', I wud have never read ur books :) after reading that one, it was like addiction.. one by one. .. I can't wait for Scent of Magic!!!!!!! Love your books by the way, they make me peaceful and happy. I shared on facebook about your giveaway! I shared on goodreads too! Thanks for the chance to enter! And I also posted on facebook, but it is unfortunately privacy protected so only my friends can read it, so I did do it, but since you can't see it you can decide to count it or not. Good luck with Scent of Magic! P.S. Later this month I'll be posting a lot of reviews of your books (specifically Inside Out, Outside In and the Glass Series) if you cared to look (or not). Good luck with your due dates and congrats on another short story! oh yeah! You may not be able to see my facebook post too. I think I also have privacy settings on. Thanks for all the entries! There's still time to enter. And I trust those who say they posted to Facebook - I'm nice that way ;> I'm only evil to my characters. Posted on my fb and Tagged you, fingers crossed! Posted on my facebook too - you'll need to friend me to see it, sorry! Not a fan of horror books but these 13 short stories would do :) Thanks for the giveaway! scary-mazegame.net website is not the for weak-hearted, do you have what it takes? 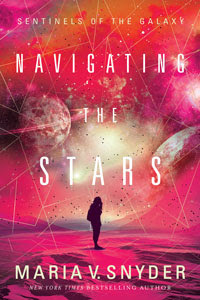 Navigating the Stars Give Away! The countdown has begun and there's about a month and a half until my latest book, Navigating the Stars is published! To celebrate, I'm giving away 2 advance reading copies (ARCs) and 12 custom book labels that I will sign and personalize for you to place in your copy. The give away is open to ALL! It ends on Halloween - October 31. Check out the Rafflecopter form below to enter. The book will be published in Australia and New Zealand on November 19, 2018. Isn't the cover gorgeous? There will be an audio book available in AU/NZ as well, narrated by the lovely Eloise Oxer. I'm also independently publishing the book in the US, Canada, and the UK on December 1, 2018. I don't have cover art yet (or links -but they're coming soon), but Josh Durham is working on it - he also did the cover art for the Australian edition. And the fabulous Gabra Zackman is narrating the audio book. WHISPER Author Interview & Giveaway! 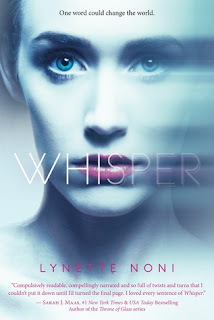 Speaking of fabulous authors, Lynette Noni's US debut YA book, WHISPER was published this summer and it's wonderful! I have an extra hardback copy and an ARC to giveaway - see the Rafflecopter below. I met Lynette in Australia when I was there for SupaNova Con. She is the sweetest person, beautiful both inside and out! Her The Medoran Chronicles are chewing up the Australian Bestseller charts and now she has a book published in the USA! She took some time out of her super busy schedule to answer my Take 10 questions about her US debut, WHISPER. Recommended Reading Order of the Study Books! DAWN STUDY (forthcoming February 28, 2017) No cover art yet! I hope this helps :). TOP Blog Tour Grand Prize WINNER!